Blockbuster video went bankrupt in 2010, and ever since, nearly all of the stores in North America have shut down. There are some remaining holdouts in Oregon and Alaska, with one of the first ever Blockbusters recently shutting down in Texas. However, there is now only one of the video stores left in Alaska and it's in danger of getting shut down as well. 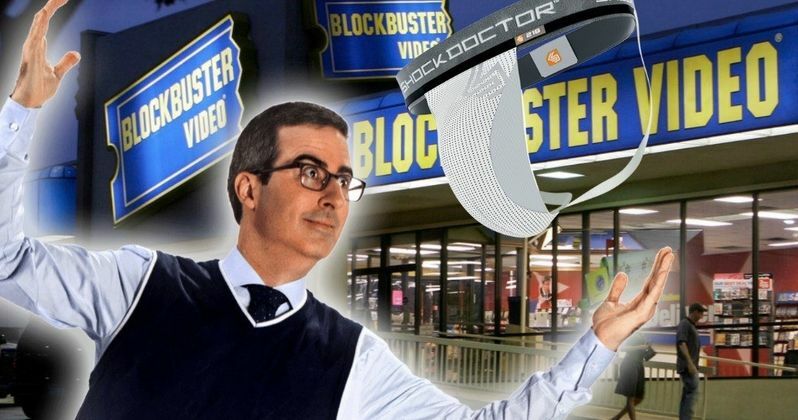 But John Oliver and Last Week Tonight have decided to buy a bunch of movie props from the Russell Crowe divorce auction, including a $7,000 jockstrap, to give to the last remaining Blockbuster in Alaska to help save the store. John Oliver is known for pulling off some pretty interesting publicity stunts, but this might be the best one yet. It had been rumored that the Last Week Tonight crew were behind many purchases from Russell Crowe's divorce auction over the last few days, which featured many props from the movies that he's starred in over the years. One of the most interesting props has to be the jockstrap that Crowe wore in Cinderella Man that Oliver and company bought for $7,000. The show took the certificate of authenticity and the garment and had it professionally set up in a glass case, so that the Blockbuster in Alaska can display it properly. When Russell Crowe was asked about the sale of the jockstrap, he had this to say. "It was my jock strap when I won the heavyweight championship of the world as the character James J. Braddock in the film Cinderella Man. I put it in the collection as a piece of whimsy and a bit of a gag. Funny enough, it's garnered a lot of attention." John Oliver and Last Week Tonight also bought Russell Crowe's chair from American Gangster as well as the back of co-star Denzel Washington's chair, which Oliver noted was more expensive than Crowe's whole chair. The vest that Crowe wore as Inspector Javert in Les Miserables as well as his hood from Robin Hood and the satin robe and shorts Crowe wore in Cinderella Man were all purchased by the hit HBO show. Everything is encased in glass and ready to be shipped to the last Blockbuster in Anchorage, Alaska. John Oliver addressed the Blockbuster management of the last store in Alaska at the end of the show, letting them know that they have 2 days to contact the show so that they can ship it to them. The last Blockbuster video rental store will now be a Russell Crowe museum as well, which should boost business, should the store decide to take Oliver up on his offer. Oliver said. "To the manager at the only remaining Blockbuster in Anchorage, Alaska, all of this sh*t is yours. Just call us in the next 48 hours and we will send it to you." Russell Crowe has yet to respond to the news that John Oliver and the Last Week Tonight team bought a lot of his divorce auction items, but one has to imagine that he's getting a pretty big kick out of it. Additionally, the Blockbuster video in Anchorage, Alaska must be pretty happy as well. You can check out a short video of the segment, detailing the purchases below, courtesy of the Last Week Tonight Twitter account.